I, the undersigned, would like to highly recommend Mr. Lakhbir of Nature Adventure Trekking & Expedition for his professionalism, his competencies, his sense of planning and duty, along with his team members. My satisfaction is shared by my son, Pierre-Jean Bernard and my friend Jacqueline .We went together to Nepal for Cultural Great Himalayan Trail route for three months which is considered trek along the locals settlements, from September to November, 28 and we have been totally satisfied with the services they provided us. 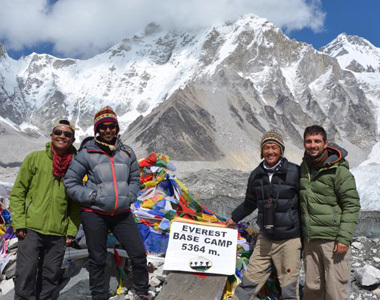 We did Kanchenjunga- Makalu and Everest 3 Pass Trekking Route Great Himalayan Trail route and Pierre- Jean climbed the Island peak when we were trekking in Everest Region and we ended the trek in Jiri. I also wanted to emphasize the fact that the part of the trek between the Kanchenjunga and the Makalu is extremely difficult, remote from off-road hardships and that the selection of the team members who escorted us was made by Nature Adventure treks. It was very judicious since these folks were extremely professional and devoted to us a lot of care and attention, qualities which are mandatory to ensure that the trek is properly conducted. At such a level, the three of us have perfectly understood that the human dimension is of paramount importance. We have lived this family trip with a lot of happiness and I can say again that Mr. Lakhbir is extremely professional.
" We were recommended to Lakhbir and Nature Adventure trekking to complete the Everest Base camp trek by a friend and we are so happy we were. This was an experience of a lifetime and Lakhbir, Ram and their team did an amazing job. There are experienced, professional, honest, organised and very nice people to deal with. They handled every detail of the trip including airport pickup, escorting us to help hire/buy equipment necessary, arranging of all domestic flights, pick up and drop off to the airport to the point of departure, all hotel arrangements and of course an awesome trek. We were guided by the wonderful Asha Rai who picked us up at Lukla airport and handled every detail of our Base camp ascent. All we had to do was walk, sleep and eat. As we are new to trekking Asha was very patient with us and was extremely attentive to our health and wellbeing as we increased altitude. Our porter "Money" carried our bags the entire trip ensuring our luggage was at each destination waiting for us upon our arrival. We can not speak more highly about this journey, this organisation and the people that made this an experience we will never forget." 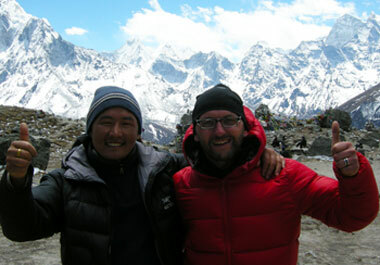 I was with Ram Rai from 5.of april to 17 of april 2013 together on the trek to Everest Base Camp. Ram is a very good, nice, reserved and polite person. I have him since the trek in my heart. As a guide he is an expert on the trekking route to EBC. He was always very flexible in daily planning. Support, help and the mental building of its customers are self-evident for him. For me, Ram has become a friend. Im also very certainly visit again. The trek to EBC was one of the best experiences in my life. Country, people and nature are so charming and amazing. The changing impressions on the trek are great. Ram was always there for me and liked to go even slightly off the traditional trekking routes to bring me a little bit closer to the land and the nepali people. He was grown together ... we reached the goal EBC before my 40. birthday….and had wonderful days in the Khumbu and any situation. The preparation of the trek he took very conscientious, and he was to return to Kathmandu always available before I flew home. In summary i can say: I can recommend Ram Rai as an perfect guide, people and partner very warmly to all climbers and trekkers who visit them and their beautiful country . another trip, adding 7 friends. If you have questions about the company and/or services, please feel free to contact me at eilemann73@gmail.com. I will certainly return in 2014 .... Thank you for the beautiful, enchanting and memorable days in the Himalaya. My overall assessment of Nature Adventure Trek as a trekking provider is highly positive and I endorse this company as a first rate Nepalese trekking agent to meet one’s trekking requirements. I have traveled to Nepal many times and in particular, have done extensive trekking in the Manaslu circuit area. The Around Manaslu experience takes the visitor to a remote area in Nepal that affords varied exposure to different Nepalese peoples and cultures, the transition of several climates ranging from subtropical to subarctic in a relatively short amount of time, and breathtaking mountain scenery. It is one of the worlds classic treks. In the past, I had always used a singular trekking company but sadly, they went out of business three years ago and I was obliged to search for a new trekking company to handle my latest trek. Selecting Nature Adventure Trek for my trek this past November 2012, was not an easy choice as there are myriad travel agencies eagerly waiting to render trekking services to foreigners. I selected Nature Adventure Trek primarily based on the reasonable cost for my trek, and for the reassurance from Nature Adventure’s Manager, Mr. Lakhbir Rai, that the services provided to me would meet my satisfaction in every aspect. I was not disappointed. My trek was longer than the average trek. It entailed 24 days around the Manaslu Massif (Nov 5 to Nov 28, 2012) with two high altitude passes to include the remote Rupina La pass, and the more traveled Larkya La pass. The staff assigned to my trek proved to be highly efficient, personable, and experienced meeting every aspect of my daily needs for such a long journey. The logistics for a long trek are detailed and Lakhbir ensured that my trek was outfitted with the finest equipment ranging from a comfortable dome style tent, to new dining equipment tables, chair, and eating utensils. Moreover, one of my big concerns was over what type of food I would be served for the duration of the trek. Proper Dietary needs are the single most important component of a trek and can either make the trek one of thorough enjoyment, or one of dismay and regret. I am happy to share that the food on the trek was plentiful, and that the lead cook offered a variety of dishes which were flavorsome and very good to eat for breakfast, lunch and dinner. The staff assigned to my trek I found to be knowledgeable with the logistics involved in camping style treks. One of the biggest annoyances of any trek has to do with barking dogs at night. My Sherpa guide did his level best to make sure that when we camped in villages that the camp ground would be generally free of barking dogs. This he accomplished and I am grateful to him for the many good nights of sleep I enjoyed. He also was adept at choosing camp sites that would not be crowded with many other trekkers and also where the trekking crew would be comfortable after a long day on the trail and where the cook would be able to prepare meals for all of us without too much difficulty. Personal safety was another primary concern to me. The Around Manaslu trek was physically demanding, and long, and entailed being in remote areas for an extended period. My Sirdar (trek leader) went beyond his call of duty to ensure that my safety would not be compromised throughout the trek. He was endlessly patient with me during some of the most challenging encounters of my journey and was always nearby to assist me with potentially hazardous terrain that we covered each day. The Sirdar was completely dependable and routinely made sure that my needs would be met. He was also quite adept at making sure the crew was well taken care of during the course of the trek making sure everyone ate well, and was in good health and well-being. The overall success of my trek was due to the collective effort of Lakhbir and to the crew he assigned to me. From the onset of my journey into its final day, it became readily apparent that my trek would be a success and this confidence never wavered. Lakhbir handled all of the details and arrangements in preparation for my pre-arrival and trek details most effectively and for this I am indeed grateful. He represents Nature Adventure Trek very well and has demonstrated to me the superior quality in services that this trekking company offers. Without hesitation, I will use Nature Adventure Trekking Company again for my future treks in Nepal that I am now already thinking about and eagerly anticipating. Namaste! Que des compliments pour cette agence qui nous a préparé un trés beau parcours de 23 jours , avec passage à 5200 mètres ! Un très bon dosage des étapes a favorisé une bonne acclimatation de tous à laltitude . Laccompagnement des guides, cuisiniers, porteurs et muletiers est efficace et convivial ; le sirdar Indra a favorisé une ambiance chaleureuse en prenant soin de tous, aussi bien des touristes que de ses hommes. Du premier au dernier jour, le sérieux et les compétences de toute lorganisation sont sans faille.